August 27, 2015 10:15 pm. AUSTRALIA is home to some of the premier Group 1 races in the world. Millions are spent by owners and trainers each year to secure the prime thoroughbreds to compete for riches beyond the average man’s wildest dreams. For us dreamers it comes down to the punt and watching these prized race horses strut their stuff – with no better viewing than the Group 1 feature races around the country. Much of this prize money is available through betting at various tote agencies and online sports betting sites, who pay money to the governing bodies, who in turn can give it back to the winning connections. The Pattern Committee of the Australian Racing Board, prior to each racing season, decides which races will be given group and listed status. The obvious biggest carrot on the Group 1 calendar is the Melbourne Cup, a 3200m staying race at Flemington racecourse; which these days is a race that attracts the best two milers in the world. Other big races on the calendar include the Caulfield Cup, a race that is probably second only to the Melbourne Cup, in terms of prestige and it being the biggest race at Melbourne’s other city track Caulfield. The Cox Plate is one of the richest races in the world and is often a good indicator of who will challenge for the Melbourne Cup, soon after. The Caulfield Cup-Melbourne Cup double is something truly cherished on the Australian turf. Below are all the Group 1 races scheduled for the 2015-16 racing season, although the dates for the 2016 races will not be released until later this year. All of Australia’s group 1 races are held at major cities racetracks, namely in Melbourne, Sydney, Adelaide, Perth, Brisbane and the Gold Coast. It is somewhat of a rolling circus for trainers, jockeys and other people associated with racing with the major races and major players moving around the country chasing the biggest prizes. Melbourne: Victoria’s capital is home to Flemington, Moonee Valley and Caulfield. Flemington plays host to the Melbourne Cup, Moonee Valley the Cox Plate and Caulfield the Caulfield Cup. Sydney: If you haven’t heard of Rosehill and Randwick and you’re an Australian racing fan, hang your head in shame. New South Wales trainers believe their racing is the best… But don’t tell the Victorians. Perth: The home of group one racing in Western Australia is Ascot where the Railway Stakes, among others, are hosted. 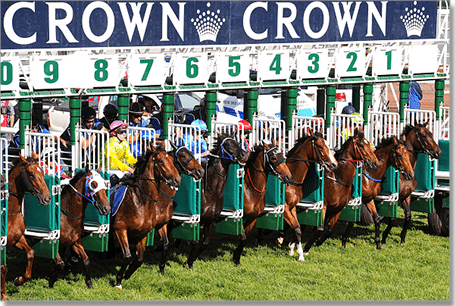 Adelaide: The biggest race of the year is the South Australia Derby, held at Morphettville. While there are not many group 1s in the City of Churches, the locals truly embrace with big names like Makybe Diva, making the trek during their careers. Brisbane: The Queensland capital has two group 1 tracks, which are Doomben and Eagle Farm. Gold Coast: Is the most raced on track in Australia and plays host to the Group 1 Winter Cup, you guessed it, in winter. Australians have plenty of choice when it comes to how and where they bet on horse racing in Australia. Some of the obvious choices are at the track, where you can bet on the tote or with a bookmaker. Probably the most popular way for Australians to bet in 2015 is via the Internet and online bookies, where you can get a swag of freebets through sign-up bonuses and offers for existing customers. If you are on a mobile device you can download the app from the iOS App store or the Google Play store here, or if on another device you can visit the mobile sites from the below links.